For all my Harry Potter fans out there, this week is almost better than Christmas! Lisa here, writing about something very close to my own heart. MOSI is gearing up for the midnight release of Harry Potter and the Deathly Hallows Part 1. (My personal excitement about this event is up over annoying status, so I do apologize in advance for how ridiculous this post may get). For the first time in MOSI history they are showing Harry Potter at midnight on Thursday night (also the 18th which is my lucky number…coincidence? I think not!). I’m also not the only Harry Potter obsessed person in Tampa since the midnight showing sold out a week ago. But fear not HP fans, there are more MOSI IMAX movie screenings to take place. For more information on show times, call, 813-987-6000. 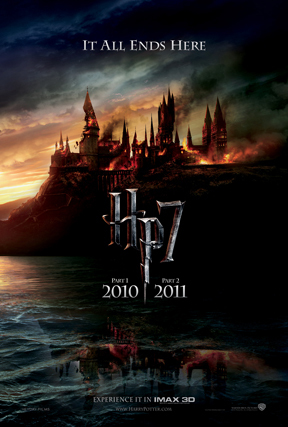 Harry Potter and the Deathly Hallows Part 1, is the first, in a two part movie series to wrap up the famous Harry Potter books (I could go into detail about this movie for pages, but I will spare you that pain). The books first hit the scene in 1997 (the movies followed in 2001), and here we are more than 10 years later, still in love with the magical books (or at least I am in love with them, and so is our fellow blogger Melissa). These last two movies wrap up the entire Harry Potter legacy, and for some of us it will be pretty sad to see it all end (I will probably cry, not kidding). So what better way to enjoy this phenomenon than at the largest theater screen in Florida! Because MOSI feels the same way I do about Harry Potter (or at least they pretend too), they are making this movie release a complete HP experience. There will be six different themed activities to go along with the movie. They have First Year Astronomy, a planetarium show that will involve learning the constellations and mythical tales of the beyond. There is also Transfiguration, another show that involves levitation, vanishing, and magic wands. They definitely are ready for this major Harry Potter premier, and so is Recylosaurus Rex. She is decked out in Harry Potter Glasses, hat and flag (I saw her this weekend, and it is worth a drive by!) So stop on in, get your wizarding license, and enjoy what is sure to be a great film. That’s all for now Tampa, but stay tuned for more Tampa Florida News updates and things to do in Tampa Bay.